Golaem Crowd 2.5 allows artists to place and animate more than skinned characters. Golaem Crowd can now instantiate any rigid shape object (trees, cars, ships...) with an interactive viewport preview and customizable visual and animation diversity. 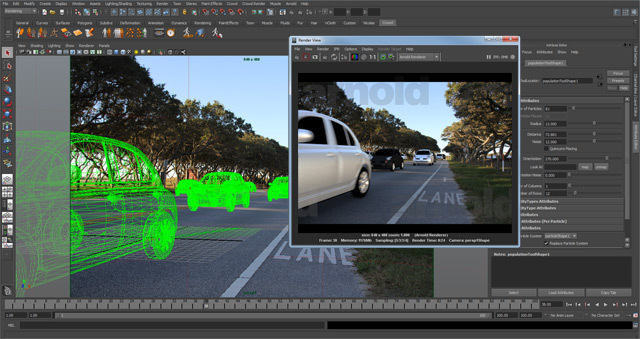 Artists can now populate the whole shot environment using the same powerful tools. Golaem Crowd has been used by Pixomondo for Game Of Thrones, season 3 and by Look Effects, to create the Boneys from Warm Bodies. Last but not least, it has also been used by several shops together with the free, ready-to-use Golaem Crowd Character Pack to create stadium/audience commercials in no time.